Correspondence, diaries, memoires, interviews, account books, inventories, and other original documents, created at the time of an event or during the lifetime of an individual or institution, that can be used to understand people and events of the past, are considered primary source material. Depending upon the project, newspaper and magazine articles, images, film, and so forth may also be considered primary source materials. The University Libraries have primary source materials in Special Collections & Archives, with some of the materials scanned and available via Digital DU. To the right are strategies for finding original, transcribed, reprinted, and surrogate versions of primary sources. Tabs on this research guide lead to digital collections of primary sources we own. Both American National Biography and Oxford Dictionary of National Biography, found under the "Biography and Genealogy" tab, list archives for individuals at the end of the essay on that individual. To find archives and manuscript collections using Google, or another Web browser, type in the name of the person, event, or country, and combine with the words archives, or in the case of a country, "National Archives." The following a highly selective list sources for finding archival materials. A collection of nearly two million archival material descriptions, including MARC records from WorldCat and finding aids harvested from the web. A current directory of repositories and collections of primary source material across the United States. The National Archives was established in 1934 by President Franklin Roosevelt, but its major holdings date back to 1775. Use the online catalog to search NARA holdings in Washington, at regional archives, and at Presidential libraries. The entire collection of NUCMC from 1959 to 2009 is searchable in Archive Finder. "The Smithsonian’s National Portrait Gallery tells the history of America through individuals who have shaped its culture. "Through the visual arts, performing arts and new media, the Portrait Gallery portrays poets and presidents, visionaries and villains, actors and activists whose lives tell the American story." An art gallery in London, England, housing a collection of portraits of historically important and famous British people. It was the first portrait gallery in the world when it opened in 1856. Allows students and researchers to analyze historical events, and their presentation over time, through commercial and governmental newsreels, archival footage, public affairs footage, and important documentaries. Limited to 3 concurrent users. A selection of images of 19th-century African Americans. The Denver Public Library’s Western History/Genealogy Department collection of digitized photographs (formerly Photoswest) chronicles the people, places and events that shaped the settlement and growth of the Western United States. It is representative of works of many outstanding photographers. Subjects include Native Americans, pioneers, railroads, mining, Denver and Colorado towns, Buffalo Bill’s Wild West Show, and the 10th Mountain Division ski troops. The library catalog is a good place to start when searching for primary source materials such as correspondence, diaries, memoires, records, and other types of documents, either held in the library's Special Collections and Archives division, reprinted as books, or microform or digital surragates of the original. Monographs written at the time of the event can make useful primary source material. All but the last of the above terms are subheadings that appear frequently in Library of Congress Subject Headings (LCSH). None of these terms necessarily means that the source was published specifically as a primary source, though they all can be used as such. Sources, applies to collections of materials, of whatever nature, that have been compiled specifically as anthologies of primary source materials. These could include collections of correspondence, articles, excerpts from longer publications, or anything else that might be useful for study of the subject. Archives and manuscripts are often used to designate collections of materials held in original manuscript format by the library. Read the introduction and/or preface, or look at the bibliographic citations for the individual transcriptions to discover where the documents consulted are kept. 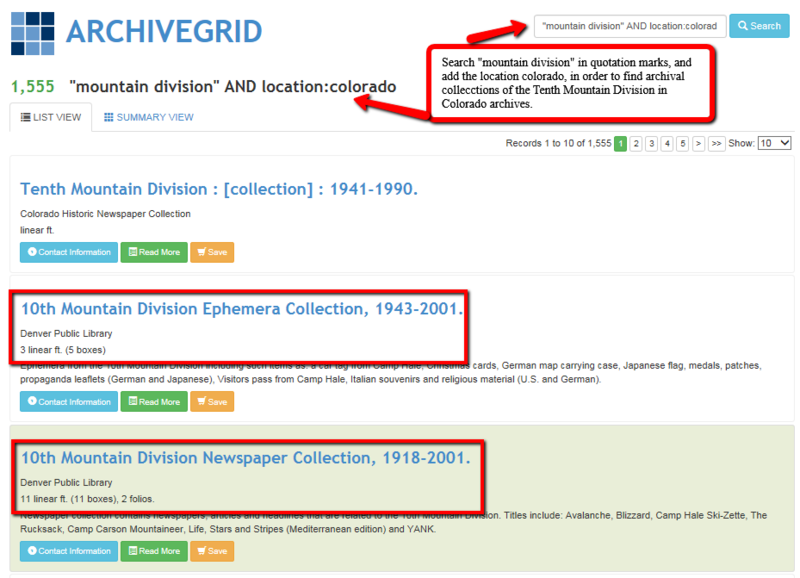 A search in ArchiveGrid and limited to location:colorado will retrieve records for physical archives in Colorado institutions. For additional sources to find archival materials, consult other boxes in this section. When searching in databases for surrogate primary sources, determine what vocabulary was used to describe the event and search using those terms. Thanks to Michael Levine-Clark for allowing me to use his text about primary source research from his chapter, "Historical Research," in Research Within the Disciplines: Foundations for Library Reference and Library Instruction, Peggy Keeran et al *Lanham, MD: Scarecrow Press, 2007) 61-82. For additional primary source digital collections, see the databases listed in the Also Useful categories in the history section of Databases by Subject. Contains the rich, comprehensive material found in leading historic periodicals and books., including eyewitness accounts of historical events, vivid descriptions of daily life, editorial observations, commerce as seen through advertisements, and genealogical records, all available in a user-friendly online environment. Based on the American Antiquarian Society’s landmark collection of American broadsides and ephemera, this full-color digital edition offers fully searchable facsimile images of approximately 15,000 broadsides printed between 1820 and 1900 and 15,000 pieces of ephemera printed between 1749 and 1900. Presents twenty-three popular periodicals digitized by Cornell University Library and the Preservation Reformatting Division of the Library of Congress. Enables students and scholars to easily search and browse legislative and executive documents of the first 14 U.S. Congresses. Presents topically-focused digital collections of historical documents that support the research and study needs of scholars and students at the university level. Brings together essential historical and current material for researching the past, present and future of African-Americans, the wider African Diaspora, and Africa itself. It is comprised of several cross-searchable component databases. Offers scholars and academics the primary sources to advance their research within the humanities and social sciences. Covers a vast range of topics including the formative economic factors and other forces that led to the abolitionist movement, the 600,000 battle casualties and the emancipation of nearly 4 million slaves. Allows users to explore the history of Jewish communities in America from the arrival of the first Jews in the 17th century right through to the mid-20th century. This rich collection brings to life the communal and social aspects of Jewish identity and culture, while tracing Jewish involvement in the political life of American society as a whole. These pages link to selected collection content available online at the Library of Congress, arranged by broad categories. The Library's online content represents only a small percentage of its physical holdings. Grants researchers access to digitized letters, papers, photographs, scrapbooks, financial records, diaries, and much more. Allows users to explore writings on slavery by those who lived it. Features primary sources, including personal narratives, pamphlets, addresses, monographs, sermons, political speeches, periodicals, poems, songs, plays and novels. Documenting key aspects of the "peculiar institution," the collection enables students, faculty and researchers to study slavery and its abolition from the 17th century through the end of the 19th century. A collection of digitized primary source material on women's role in the U.S. economy from Harvard's collections.